“Ammaachchi” was the name chosen by Northern Provincial Council's Ministry of Agriculture for a concept of traditional restaurant. The United Nations Development Programme financially assisted the initiative, which was launched in Vavuniyaa under the previous minister Mr P. Aingaranesan. The food court became a success earning a good reputation. The kitchen, driven by grassroots women groups, has been promoting war-affected women with livelihood opportunities and was serving traditional Tamil cuisine at affordable price and good quality. Soon, the concept was expanded to Ki'linochchi. 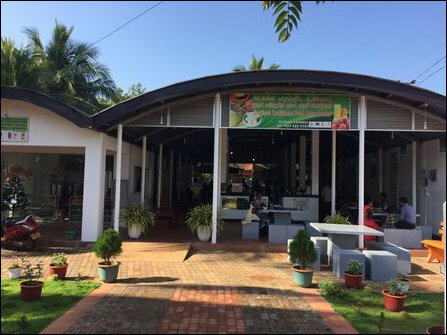 However, when a similar NPC initiative was to be launched at Thirunelveali in Jaffna at the initiative of the same NPC ministry, Colombo based unitary system, preoccupied with the genocidal idea of ‘uniform Sri Lanka’, has been insisting upon naming the restaurant with its Sinhala counterpart, Hela Bojun. Since the NPC didn't have funds allocated in its budget to invest into the native food court outlet, it had approached the SL Ministry of Agriculture in Colombo. SL Minister of Agriculture, Duminda Dissanayake, has been insisting upon the organisers to name the food court Hela Bojun. After Mr Ayngaransean resigned from his ministerial portfolio, the ministry was supervised directly by NPC Chief Minister Justice C.V. Wigneswaran, who didn't yield to the pressure from Colombo's ministry. PLOTE's Kandiah Sivanesan is the incumbent minister of agriculture at the NPC and has been seeking to resolve the dispute through engagement with Colombo's ministry. However, the SL ministry in Colombo was insisting upon naming the food court as Hela Bojun, informed NPC sources said. As a result, the kitchen is now operating without a name board. ‘Uniform Sri Lanka’ is more genocidal in nature than ‘unitary Sri Lanka’, commented Tamil observers in Jaffna. This is an example illustrating the modus operandi of the so-called concept of ‘uniform Sri Lanka’, which is being envisaged by the external powers through the current constitutional discourse in the South. 21.10.17 Unitary constitution imposing choice irrelevant to fundament..
30.08.17 Mahanayaka's visit to Jaffna exposes Sinhala-Buddhist conver..